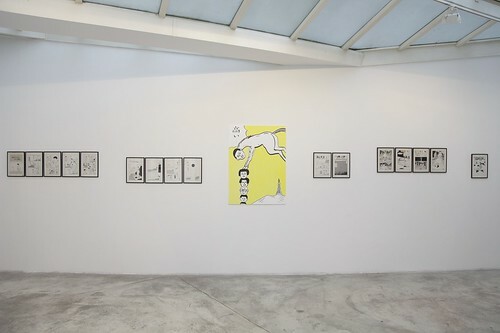 A few months ago in Paris, an interesting exhibit opened featuring original comic pages and paintings from a fantastic line-up of some of my favorite artists. Running from April 15 until May 22, the exhibit, Underground & Secret Manga, featured work by Yoshikazu Ebisu, Usamaru Furuya, Kanako Inuki, Suehiro Maruo, Junko Mizuno, and Toru Terada. More details on the exhibit are on this post on the Hattenba Production blog. Hattennba Productions appears to be taking on an interesting role of advocacy that I haven't really seen before, doing outreach from Japan to other countries in English (and Spanish, French, etc) about their stable of cartoonists. Right now, they are promoting Garo alums and influential underground manga artists Yoshikazu Ebisu, Takashi Nemoto, and Issei Sagawa. This is a pretty exciting idea, and I wonder who in the States is already in touch with them? I can imagine with Hattenba providing the support and making deals/coordination easier, it could theoretically be possible to have a show like this in New York or at San Francisco's SUPERFROG Gallery space in the New People center. --For folks that have been to visit, SUPERFROG is a fantastic space for interesting shows but their programming and curation to date has been really weak. Loosely themed and sorta uncontemporary group shows? Yoshitaka Amano overprized day-glo paintings? They seem to not really have an idea what they want to do with the space, and it seems to be months passing before new exhibits go up. In lieu of every show they've done to date, I'd have loved to see an exhibit like this one in Paris made to happen in San Francisco-- along with about a dozen other ideas for shows I have (What I'm Saying Is: HIRE ME TO CURATE THAT THING, PLZ)??? Unique in our time, Manga has become a culture, a world and an industry whose stories and characters appear in the print media, films, video games and tie-ins. 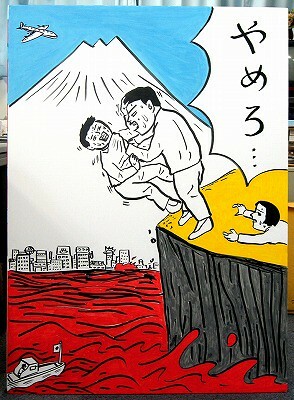 It also represents a resource pool many contemporary artists have no qualms about exploiting. specific readerships – Shounen for boys, Shoujo for girls, Seinen for adults –there also exist unclassifiable experimental books hinging more on deep experience than on mere entertainment. Whether Manga’s critics like it or not, these books are «dangerous» in that they represent a host of thresholds, doorways and channels leading to visionary, nightmarish, grotesque worlds whose common characteristic seems to be the absorption of those who look into them. 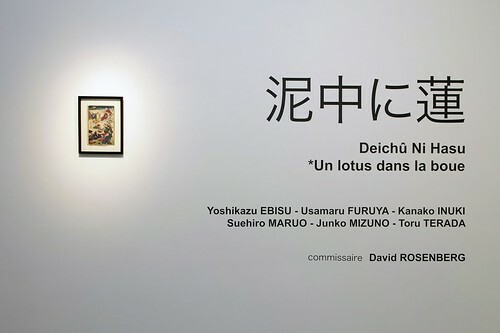 Yoshikazu Ebisu, Usamaru Furuya, Kanako Inuki, Suehiro Maruo, Junko Mizuno and Toru Terada: it is to these dedicated practitioners of the draughtsman’s art that this exhibition is devoted. While the exhibit features a number of cartoonists we dig, I wanted to specifically highlight the works of Yoshikazu Ebisu. I admit to not knowing a ton about the artist beyond what Fred Schodt wrote about him in Dreamland Japan, and his short bio from the back of Comics Underground Japan. He seems like a fascinating dude, who didn't start drawing manga until his 40s, publishing a number of short comics in Garo during the 80s and 90s about the hellish life of white-collar drones. Two of those comic, "Hell's Angel" (Jigoku no Tenshi) and "It's Alright If You Don't Understand (Wakaranakutee mo Daijoubu) were published in the 90s in Comics Underground Japan. "Hell's Angel" is the first comic in that anthology, and sets a darkly satirical tone for the tome as it follows a nightmarish, neverending commute home by a generic every(salary)man. 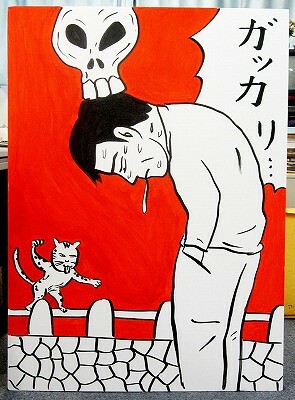 The soulless tedium and mechanized alienation of Japan's corporate culture is a recurring theme in Ebisu's witty and scratchy depictions. He did a whole run of salaryman comics, one of which (Salaryman From Hell) was scanlated by our friend Rizzah over at Wanted: Cheap Manga. For forks looking for more on Yoshizaku Ebisu, please check out his personal website, and the three pages from Dreamland Japan that Fred Schodt dedicated to his works. And here is the man himself, Ebisu! AAAAAHR damn, now you post something that is already over T_T Paris would have been reachable for me at least. Better luck next time. Wow, seems so amazing. Ebisu was partially responsible for introducing all of the manga world to me! Wish dude got some play in America (outside those two stories). Nice pictures of Ebisu. 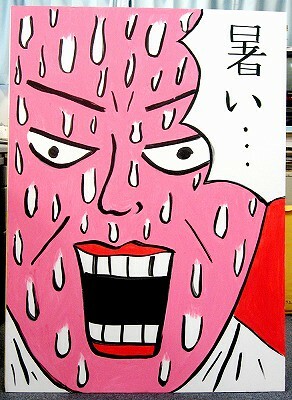 I read his work on Comics underground japan. I also read Salaryman from hell that was great. I hope Last Gasp or Fantagraphics maybe can release work for this incredible author. Ryan you put Takeshi Nemoto in the part of labels instead of Yoshikasu Ebisu!! Apart from that, sorry for being in Limbo. I hope you are allright. I didnt write you any mail because I had a some problems but now I am better. Saludos from Argentina as always and keep the good workd!! By the way, the link to his personal website seems to actually go straight back here..
@RSS: Yeah, I totally agree! @Azraelito: Hey buddy! Nice to hear from you-- sorry to hear about the problems but glad to see you back-- I'll send you an email finally, i've been so behind! hey ryan do you have his comic? 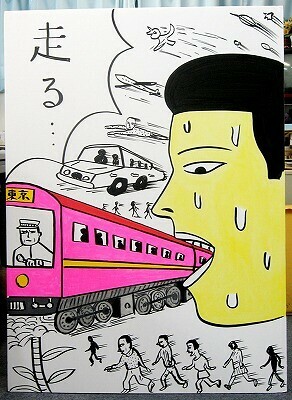 i only ever see one story "salaryman from hell"
man, i really hungry of horror manga. This exhibition wasn't very good. Very promising by the name dropping but very disapointing concerning the low quality of pieces hung. The Maruo pieces were not as incredible as the one exhibited same time at SAG in Toyo. Same for the Usumaru ones. And concerning the price this was ridiculously expensive : eg for the same price of a tiny b&w Maruo you could get an excellent coloured one at Span Art. I only have the Maruo/Usumaru catalogue part if you want. I didn't care about the others. Ebisu! Love that guy, did you ever see his defunct blog, with photos of him just lying around his house?